Court Yard Hounds is an American country music and folk duo, founded by sisters Martie Maguire and Emily Robison. They, along with Natalie Maines, make up the Dixie Chicks. The sisters decided to record a side project under a different name. Court Yard Hounds, featuring Robison for the first time as lead vocalist, released a debut album for Columbia Records, the same label for which the Dixie Chicks has recorded, on May 4, 2010. The album debuted at No. 7 on the Billboard 200 chart, initially selling 61,000 copies. It has sold approximately 825,000 copies in the United States. 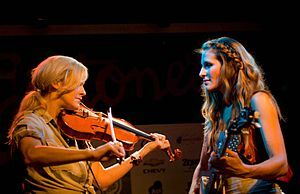 Emily and Martie Erwin, now Emily Robison and Martie Maguire, founded the Dixie Chicks in 1989 with Robin Lynn Macy (lead vocals) and Laura Lynch. They released two independent albums before Macy left, and their third album was released with Lynch on lead vocals. In 1995, Lynch left and was replaced by Natalie Maines. The group was then signed to Monument Records and released two hit albums, before departing from Monument in 2000 and founding their own label, Open Wide Records, in association with Columbia Records. They then released their third album Home to critical acclaim. During a London concert ten days before the 2003 invasion of Iraq, lead vocalist Maines stated, " Just so you know, we're on the good side with y'all, we don't want this war, this violence, and we're ashamed that the President of the United States is from Texas" (the trio's home state). The statement offended their core fan base who thought it rude and unpatriotic, and the ensuing controversy cost the group half of their concert audience attendance in the United States and led to accusations of the three women being un-American, as well as hate mail, death threats, and the public destruction of their albums in protest. The group followed a small hiatus with a live album and a documentary highlighting the maelstrom created by Maines' comment entitled Dixie Chicks: Shut Up and Sing. The Dixie Chicks released Taking the Long Way in 2006 which has since sold over 3 million copies and ultimately won five Grammy Awards. The Dixie Chicks have been on hiatus since 2008. in 2016 they reformed for a world tour. Court Yard Hounds was formed in 2009 when Maguire and Robison wanted to return to the studio however Maines was still reluctant to do so. The duo's project was announced in January 2010 and the album features Emily on lead vocals. Robison said that the album is "very personal" and she would also be joined by singer-songwriter Jakob Dylan on a track called "See You in the Spring". The band signed to Columbia Records and released their self-titled debut album on May 4, 2010. Their first public appearance as Court Yard Hounds was on March 18, 2010 at the Americana Music Association's SXSW showcase in Austin, Texas. With Robison on lead vocals she is backed up by her sister Martie, with other band members consisting of Natalie Maines' father, Lloyd Maines, on guitar, and other members from the Dixie Chicks' backing band; the debut album was also recorded in Maguire's home studio. According to Maguire and Robison, the Dixie Chicks have not parted ways. And still continue to make appearances including touring with the Eagles and Keith Urban in 2010 and appearing at selected events, such as the Calgary Stampede, in 2013. Court Yard Hounds' second studio album, Amelita, was released on July 16, 2013. "Sunshine," the album's lead single, was released on June 10, 2013. In 2015, the Dixie Chicks announced a tour of Europe for the following year, later also announcing a tour in North America, their first tour in years. "It Didn't Make a Sound"
"See You in the Spring"
"She Sang Hymns Out of Tune"
^ NAME: (May 12, 2010). "Lady Antebellum, Zac Brown Band & Miranda Lead Charts This Week | New Country Music, Listen to Songs & Video". Roughstock.com. Archived from the original on December 24, 2013. Retrieved February 10, 2012. ^ "Dixie Chicks 'Shut Up and Sing' in Toronto". MSNBC. Archived from the original on October 28, 2009. Retrieved October 8, 2006. ^ Edward Morris (January 11, 2010). "News : Two Members of Dixie Chicks Releasing Album Without Natalie Maines". CMT. Archived from the original on January 15, 2014. Retrieved February 19, 2010. ^ a b David Browne. "Pair of Dixie Chicks Plan Album, Tour as New Band Court Yard Hounds : Rolling Stone : Rock and Roll Daily". Rolling Stone. Retrieved February 19, 2010. ^ "The Official Court Yard Hounds Site". Court Yard Hounds. January 15, 2010. Archived from the original on May 17, 2014. Retrieved February 19, 2010. ^ "Dixie Chicks Sisters Return as Court Yard Hounds". The Boot. January 15, 2010. Archived from the original on July 12, 2012. Retrieved February 19, 2010. ^ "Two Dixie Chicks Rename Themselves as Court Yard Hounds". CMT. January 15, 2010. Archived from the original on January 15, 2014. Retrieved February 19, 2010. ^ "Dixie Chicks Team With Eagles for First Tour in Four Years". Rolling Stone. March 17, 2010. Retrieved April 3, 2010. ^ "Single Releases : MusicRow – Nashville's Music Industry Publication – News, Songs From Music City". Musicrow.com. Archived from the original on February 12, 2014. Retrieved July 15, 2013. ^ "Court Yard Hounds Album & Song Chart History – Billboard 200". Billboard. Retrieved October 16, 2010. ^ "Court Yard Hounds Album & Song Chart History – Rock Albums". Billboard. Retrieved October 16, 2010. ^ "australian-charts.com – Australian charts portal". australian-charts.com. Archived from the original on October 16, 2012. Retrieved October 16, 2010. ^ "Court Yard Hounds Album & Song Chart History – Canadian Albums". Billboard. Retrieved October 16, 2010. ^ "charts.org.nz – New Zealand charts portal". charts.org.nz. Archived from the original on October 24, 2012. Retrieved October 16, 2010. ^ "swedishcharts.com – Swedish charts portal". swedishcharts.com. Archived from the original on October 24, 2012. Retrieved October 16, 2010. ^ "Die Offizielle Schweizer Hitparade und Music Community". hitparade.ch. Archived from the original on November 11, 2012. Retrieved October 16, 2010. ^ "Chart Stats – Court Yard Hounds". chartstats.com. Archived from the original on April 5, 2012. Retrieved October 16, 2010. ^ "Court Yard Hounds - Adult Alternative Songs". Billboard. Retrieved February 17, 2018. ^ "It Didn't Make A Sound [+Video]: Court Yard Hounds: MP3 Downloads". Amazon.com. Retrieved July 15, 2013. Wikimedia Commons has media related to Court Yard Hounds. This page was last edited on 13 March 2018, at 21:30 (UTC).